Include a column for each of the single-valued, accessible properties on the node identified by the selector. 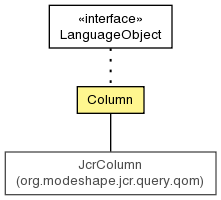 A column with the given name representing the named property on the node identified by the selector. Get the name of the column. Get the name of the property that this column represents. Get the name of the selector for the node. Create a copy of this Column except that uses the supplied selector name instead.